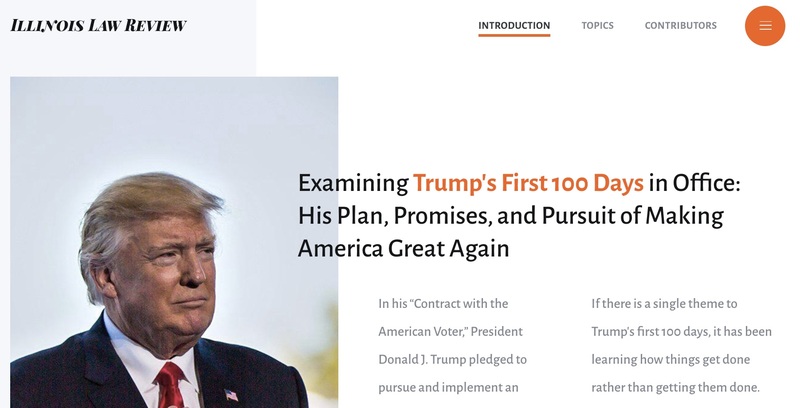 On President Trump’s 100th day in office, the Illinois Law Review launched a brand new online symposium with essays about issues related to the President’s campaign promises and executive actions. In this post, their team’s incoming and outgoing editorial boards share why and how they undertook this project, how they hope it will impact legal scholarship, and their advice to other law reviews looking to do something similar. How did your team come up with the idea for the online symposium, “President Trump’s First 100 Days,” and why did you decide to make it a reality? Lindsey Lusk, 2016-2017 Editor-in-Chief: I had talked with my Managing Internet and Symposium Editor, Katie Kargl, about trying to get some online content for the first 100 days, but we hadn’t formally coordinated anything yet. Then, in mid-March, the chair of our Constitutional Law Program here [at University of Illinois College of Law] reached out to me and said that he and the dean of our law school were interested in doing something to mark the 100th day of the Trump presidency. He pitched the idea of an online symposium for the first 100 days. It would be a tight turn around, but I immediately agreed. I knew it was a great opportunity and they were already recruiting some of the best scholars in the nation to write. We decided that we would have a panel event on April 11 featuring eight speakers, each discussing a different aspect of the Trump presidency. They would then submit a short essay on their topic, which would go live as a symposium on April 29, the 100th day. We would also invite experts in a variety of areas to submit pieces for the online symposium. In agreeing to do this, though, I had to ask members of my board to go above and beyond what was required of them. The Law Review was in the middle of a transition period, with the new board officially taking over on April 14th, two weeks before the symposium would go live. I didn’t want to agree to this and then suddenly drop it in their lap. So, I asked Katie and members of my executive board to continue to work after April 14th. It would, in essence, be our board’s final project. Fortunately, they all agreed and Katie immediately began coordinating authors. We did work with members of the new board, particularly incoming Managing Internet and Symposium Editor Bradley Williams with support from incoming Editor-in-Chief Ben Paulsen, but that way we weren’t overwhelming the new board right as they took over. We decided not to set a limit on the number of authors that could participate. We figured, there were so many issues that were implicated in the first 100 days, so we should try to get great scholarship on as many of those areas as possible. Honestly, I think Katie and I expected to only get about 15 pieces. It was such a short turnaround, we didn’t know if people would be able to write on such short notice. So we were blown away when we got 31 pieces. We received all of the final pieces between April 22nd and April 25th, so it was an extremely hectic few days trying to put the pieces through two rounds of edits and a final proof. We were also designing a special page for the symposium on our website, which added to the stress. Overall the days leading up to April 29 were crazy and gave way to late nights, including staying up until 3 a.m. the night before the launch of the symposium. But it was worth it. We are immensely proud of the final product and have received some great feedback on it. It was demanding and a lot more work than I think any of us could have imagined, but we did it. It would not have been possible without the team effort we had. Even though it meant extra work during an already incredibly stressful time in the semester, everyone stepped up and gave it their all, particularly Katie and Brad. I could not be more proud of our team and our work. It was a great project to end my tenure on. Who was involved - from your editorial board, your school, etc. - in organizing the symposium? Katie Kargl, 2016-2017 Internet and Symposium Managing Editor: There were many individuals involved that helped make this symposium a great success. Professor Jason Mazzone was heavily involved in organizing the symposium and the contributors involved in it, along with Dean Vikram Amar and various law school staff members. In addition, myself, Lindsey Lusk, and Bradley Williams organized the publication of the symposium, along with the tremendous help of Benjamin Paulsen, the Executive Board members, and the members of the Internet & Symposium Committee. You have 29 articles on different topics published on a beautiful microsite. How did your team manage all the moving parts of finding authors, having articles ready to publish, and creating the site? Brad Williams, 2017-2018 Internet and Symposium Managing Editor: We were able to manage all of the authors and have the articles ready to publish through constant communication. We organized all the author pieces in one Google spreadsheet and updated it as we completed editorial tasks. We were incredibly fortunate to have our former Managing Internet & Symposium Editor, Katie Kargl, regularly communicating with professors on the progress of their submissions. She was crucial to making sure these moving parts were moving in the same direction. Concerning the website, that was primarily our website developer, Chris Lusk. He was the mastermind behind the design and development. We made sure to have the content available to him 48 hours before publication, and he transformed the content into what you currently see on the website. What impact do you hope “President Trump’s First 100 Days” has on legal scholarship, and what are you doing to promote that? Benjamin Paulsen, 2017-2018 Editor-in-Chief: A lot of legal scholarship published in Law Reviews has a significant time gap from conception to publication. One way we hope this symposium impacts legal scholarship is to demonstrate that high-quality legal writing can be turned around quickly, without impacting a piece’s quality. This format provides a forum that does not require six or seven months between the submission and publication of a piece, but only a few weeks; facilitating more conversation and relevant scholarship. As a Law Review, we recognize that in addition to traditional Law Review articles there is a need for more symposia like “President Trump’s First 100 Days” to provide for this timely input on current legal matters, and we will continue to promote this style of scholarship by seeking additional topics suited for this style of publication. This was an extremely timely project, with your announcement of the online symposium site exactly on President Trump’s 100th day. Reflecting back on your experience, what advice can you share with other teams planning timely symposia or special issues? The following points are a collective response from the editors interviewed above. Have a flexible publication framework. Our team created a structure for publishing each article, but we quickly understood that each article required specific needs: we changed our timeline to meet each author’s needs. Allow ample time for editing. We, fortunately, had many students on our editorial board reviewing articles prior to their final submission. Each piece went through at least two rounds of editing before publication. Have someone on your team familiar with website design, website development, and networking. We were incredibly fortunate to have three individuals on our team who have legitimate experience creating website designs and content. Make sure to be comfortable with your editorial staff. Our symposium would not have been nearly as successful as it was unless Lindsey, Katie, Brad, and Ben were as communicative as we were throughout the process. Being able to bounce changes off of each other quickly was critical to the success of the symposium. Wondering which law reviews only accept submissions via Scholastica? In this post we provide lists of all general and specialty law reviews that just accept submissions via Scholastica as well as a breakdown of where the top-100 general law reviews accept submissions. Donna Shestowsky, professor at UC Davis School of Law, shares the details of her recent study on litigant awareness of alternative dispute resolution programs. Deborah Farringer, assistant professor of law at Belmont University College of Law, discusses her recent article on Electronic Health Record vendor liability and whether EHR vendors are being held accountable for how their software impacts the quality of patient care. There are many misconceptions about what constitutes material that can be trademarked. According to Alexandra Roberts, professor at the University of New Hampshire School of Law, trademarking hashtags is rarely a valid option.